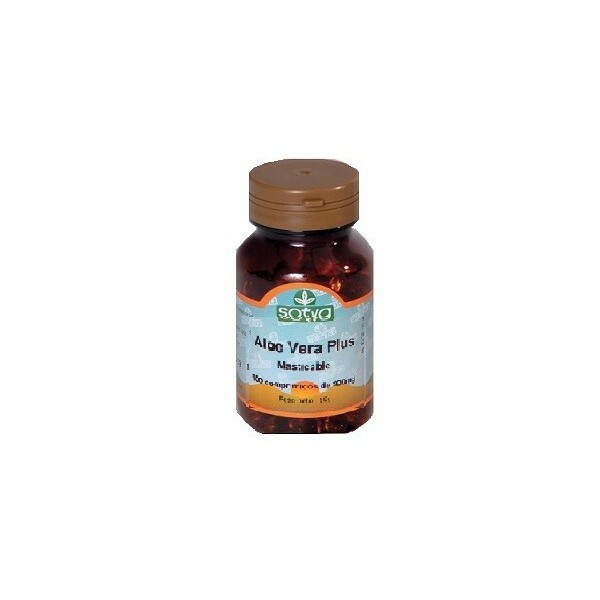 Aloe Vera Sotya 1 gram 100 chewable tablets. 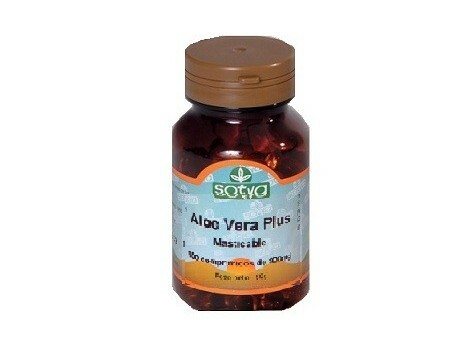 Aloe Vera Sotya 1 gram 100 chewable tablets. Applications: Dietary supplement especially recommended against serious problems and slow digestion aerofagia Composition per tablet: Properties: Aloe vera (Aloe barbadensis) is a plant with fleshy leaves and thorns that grows in desert climates such as South America and Mexico. From the leaves juice is extracted, which is then concentrated to obtain the extract, all natural active ingredients of the juice, but without water. The active substances are polysaccharides and anthraquinones, which owes its properties. The aloe vera is a laxative that acts on the intestine. Taken in small amounts, is an excellent carminative and stomach. Have been attributed to many almost miraculous healing of ulcers and irritable bowel syndrome, since it is also a good scar. Fructo-oligosaccharides are some from the fruit. They act as an insoluble fiber, so that speed up intestinal transit, combating constipation and improve the intestinal flora, helping the proliferation of "good" bacteria to fight bacteria and "rotten." Papaya also contains high amounts of digestive enzymes, which help especially in the digestion of proteins, accelerating their passage through the stomach. On the other hand, pineapples, bromelain as the active ingredient, is an excellent digestive, highly beneficial in cases of slow digestion. At the same time, has anorectic properties, ie, decreases appetite. The main active component of the "heart" of the pineapple is bromelain and bromelain. This powerful enzyme, which is also found in the rind and pulp, is able to swallow approximately 1,000 times its weight proteins in both acidic and basic conditions. For its digestive power, pineapple has revolutionized the diet worldwide, especially in relation to digestive problems, slimming and cellulite treatments. Bromelain is used successfully to treat many diseases and the treatment of inflammatory processes, such as anti inflammatory power makes them very promising and effective treatment of inflammation of the digestive system. In situations where there is fluid retention, promotes diuresis and helps release more easily the masses of fat (the famous orange peel cellulite) and it is a good vasodilator. The fifth ingredient is the acidophilus, bifidobacteria such as those found as part of the intestinal flora. Well known are the effects of bifidobacteria have on the body, by keeping our intestinal flora in very good condition, with healthy bacteria, we avoid the proliferation of bacteria "rotten" and other gastrointestinal infections (such as yeast infections) A supplement with bacteria bifid live is especially recommended in cases of antibiotic treatment, stress and diarrhea, as in all these cases the integrity of our flora is threatened. Anise is a diuretic, stomachic, expectorant, spasmolytic and carminative. Thanks to its active (anethole) stimulates all the glands, causing an anise galactógena first order. Finally, in addition to their high quality diet, this preparation also contains vitamins and minerals essential for physical balance, body compensating losses in strict dieting and malabsorption caused by digestive problems. Ultimately, these chewable tablets are very useful in the treatment of constipation, such as repairing intestinal cleanser. A supplement to this type regenerates the bacterial flora, aids in digestion and prevent gastrointestinal symptoms associated with indigestion, aerophagia, inflamed intestinal mucosa, colon irritable, etc. Presentation: In containers of 100 chewable tablets 1g. Directions: Take 2-3 tablets before meals.